Chickpeas, aka Ceci or Garbanzo beans, are one of the earliest foods of the human diet. Falafel, its most popular preparation is vastly popular all over the Middle East. Besides being a wonderful meat replacement for vegetarians, falafel is just plain good groceries no matter how you use it; either as a delicious sandwich in pita bread or as a wonderful meatball substitute with tomato sauce. Traditionally, falafel is made from ground-up, soaked, dry chickpeas. Falafel vendors selling this street food are ubiquitous in Egypt and Israel and plenty of other places nowadays. Even McDonalds, the hamburger chain, sells falafel in many places, where they are called “McFalafel”. 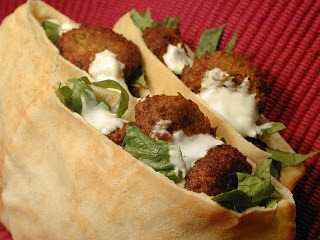 After cooking, the tasty falafel is put into pita bread with a cooling creamy sauce, or a tahini sauce. It is one very delicious sandwich. Be sure to soak the dried beans, covered with plenty of water, for 20-24 hours. Prior to shaping and cooking, thoroughly chill the falafel mixture for at least one hour. Here is a traditional recipe I adapted from Tyler Florence. 8 warm pita breads cut in half. Put the dried chickpeas in a large bowl and add cool water to cover by 2 inches. Soak the beans in the refrigerator for between 20 to 24 hours. This soaking is important. Rinse and drain thoroughly. Put the soaked chickpeas in a food processor and pulse to coarsely grind, with no whole chickpeas remaining. Add the baking powder, onion, garlic, spices, and herbs; process until the mixture is pureed; scraping down the sides of the bowl as needed. Taste and season with salt and pepper. Transfer to a bowl and be sure to refrigerate for at least 30 minutes. Pour 3-4 inches of oil in a deep fryer or deep heavy pot and heat to 375 degrees F (190C). If using the pot, a thermometer is very useful. Roll all the falafel mixture into balls 1 ½ inches in diameter. Carefully slip a few at a time into the hot oil, making sure they don't stick to the bottom. Fry until the fritters are a crusty dark brown on all sides, turning as needed, about 4-5 minutes per batch. Remove the falafels and drain on a rack or platter lined with paper towels. Open the pita bread halves carefully to make pockets and put 4 fried falafels into each. Drizzle with the sauce and layer with lettuce, tomatoes, and cucumbers. Serve immediately. Combine all in a food processor and blend thoroughly. Let chill 30 minutes. If you choose to use this, prepare it just before you make the falafel. Falafel is a very tasty food, and goes great in a pita pocket. Try it, you’ll like it. Bring on the pita bread recipes. They have a love affair with busy Americans. This one sounds/looks especially delicious. Not only good for you but saves on dishes. Can't beat that. I love love love falafels! I will try this for sure! Hi Anthony, really good post about falafel, hope you're doing well! wow....that looks yummy.....nice blog anthony...glad to be following you.....do stop by mine sometime..
MANZANITA: You are so right. pita is very versatile, and minimizing dishes is great. Sometimes I see the sink so full like we had a dinner for twelve and it's just the two of us. JOANNE: Get ready for a delicious experience. THE KUANTAN BLOGGER: Thank You Duncan, my best to you and the girls. CAY SERA: Thank You for the compliments, I appreciate them. I love using pita bread... I am also a huge fan of Garbanzo beans so this recipe is right up my alley. Love falafel, looks fantastic. A very filling and healthy meal. Oh! I love these wonderful Falafel in pita pockets. Very well explained recipe which makes it sound so easy to make. Oh my gosh! I've always wondered how to make falafel. Thanks for sharing this, anthony! I really like chickpeas . . . I'll have to bookmark this post! MY JOURNEY: You will appreciate the ease of making this. btw- Today I gave my daughter some Tru Flora enzymes for her GERD after reading about it on your blog. If it works I will be extremely grateful. SENSIBLE VEGETARIAN: You're sure to love this. Thanks for calling. SCHMETTERLING WORDS: Thank You for the kind words. McFalafel in Israel, maybe in Egypt too. THE GOLDEN EAGLE: You will love this falafel. I recently tasted falafel and loved it. I will probably be playing around with a baked version sometime. These falafels look absolutely tempting. SARAH: Thanks for calling, I don't know anyone who doesn't like falafel. I always use the cucumber sauce (tzatziki) with it. VARDHINI: You're right, they are quite tempting. I thought about baking them myself. One batch I made in oven and it came out very well. Baked is lower in fat but frying is quicker and of course more traditional. They must be delicious falafels. MALLI: I would urge you to try it, it is spectacularly good. I love falafels like everyone else especially because it has the familiar taste of spice suited to an Indian palate. You have made them perfectly, love how crisp it looks! AIPI: Yeah, the taste is wonderful. The first time I tasted them I enjoyed the "exotic" flavour. Thank You for the kind words. MIRIAM: Even committed meat-eaters will love this. This is one of those dishes, like kasha http://gritsandgroceries.blogspot.com/2011/04/kasha-pilaf.html, that when I have it I wonder why I don't prepare it more often. Falafel is one of my favorite dishes and just can have it any moment...just mouthwatering...the recipe looks so easy to prepare and delicious! KALYAN: You're right, is not difficult at all and very delicious. TORVIEW: Thank You is a thoroughly wonderful meal. Love this, never tried it you have me wanting some now and made it simple to understand to make thanks! I've never had falafel ... I've always thought it was one of those words you could not say five times fast without laughing. No McFalafels out here, but if I ever see one I'll definitely try one. This is a great recipe. I love falafel and my favorite place to get falafel went out of business, so I definitely need to try this recipe. Looks really good. PEGASUS: Once you try it I'm sure you will love it. STEPHEN: It is one of those words, but more than likely if you do not make it yourself you won't be able to enjoy it. Therefore I offer this gastronomic item for your gustatory consideration. LV: Thanks, you will love this falafel. Till now I haven't tasted falafel. But before I start, I'll try from outside shops where you have mentioned. So that I can get to know the taste. BTW your falafel inside the pita is making me drool. love to grab one. UMA: You may not be able to get falafel in your area, neither can I; but I hope you will make this fabulous food. If you don't care to bother with the sauce you could use bottled "Ranch dressing" to start. But falafel is "Droommy", which is a combination of droolworthy and yummy. Thanks for sharing the recipe. I'll have to give it a try. SUSANNE: Thanks for calling, falafel makes a delightful sandwich. Best wishes on the World of Ink tour. I love falafel but have never been brave enough to make my own. You've just inspired me! LUV'N SPOONFULS: It really isn't hard to make at all, you can do it and then you will make it often. I'm loving this! And Pita recipes are the BEST! KAVERI: Now you can, please give it a try it is delicious. ALEXIS: Yeah, we love it too. Thanks anthony stemke, for the recipe. I tried this but used storebought pita bread. It was good. Though I have not tasted them before I liked them. UMA: I am so happy to hear that you liked them, falafel is a great food to have on a regular basis.